BLOOM TIME: Mid Summer - Fall HARDINESS ZONE: Annual (but reseeds itself easily, so it acts like a perennial in all zones) PLANT HEIGHT: 36 - 48" . . . PLANT SPACING: 15 - 18" LIGHT REQUIREMENTS: Sun . . . 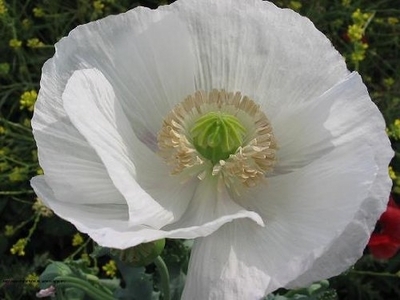 SOIL / WATER: Average Poppies attract bees, butterflies, and birds. The huge showy 2 - 4 inches blooms make them an excellent cut flower, and their unique looking seed pods are splendid in dried arrangements or for crafts. They are known in folk medicine as a mild sedative and analgesic.